Your eye exam begins with a relevant medical and ocular case history. You will be asked for a current list of medications. 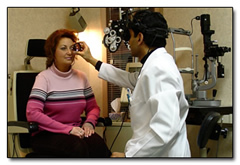 Our optometric assistant will then perform a number of test ordered for you by your doctor. These may include, keratometry, non-contact tonometry, verification of your existing spectacles (automated lensometry), stereoacuity testing, color vision testing, angle assessment, pupil testing and visual acuities. Specific drops ordered by the doctor will be instilled to dilate your pupils. This allows the doctor to thoroughly examine the internal health of your eyes for sight-threating diseases as well as ocular manifestations of systemic disease. 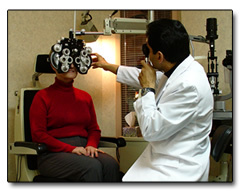 At this point, the doctor will review your case history and refine any concerns you have relating to your eyes/vision. He will then perform a ocular neurological exam including muscle balance functions. Next your vision will be tested (refraction) both objectively and subjectively. These results with be discussed with you. Next, the doctor will use a binocular indirect ophthalmoscope and slit lamp biomicroscope (with and without condensing lenses) to examine the tissues of your eyes from the lids to the retina and optic nerve head. 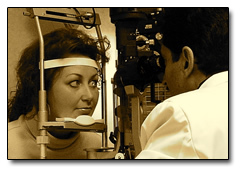 This is a critical component of your exam as it allows us to diagnose and manage sight threatening diseases. You may require further eye testing to define the diagnosis further. Examples of these tests include, ultrasonic pachymetry, applanation tonometry, diurnal IOP test, gonioscopy, dilation and irrigation of the nasolacrimal ducts, visual field testing and Heidelberg Retinal Tomography. These tests would require follow up appointments. At this point the doctor will review all the relevant findings and you will be provided with a diagnosis and treatment plan to resolve your eye/vision problems. Treatment options may include glasses, contact lenses, medication to treat your eyes, referral for surgical consult to treat your eye condition, as well as referral to your family doctor or other specialist to deal with a systemic condition manifest in the eyes. Dr. Rawal and Dr. Guthrie will communicate with your doctors where necessary to co-ordinate care.